Ontario is moving forward with its plan to help lower auto insurance rates by requiring all insurance companies in the province to provide a discount for drivers who buy and install winter tires, starting January 1, 2016. Today, Minister of Finance Charles Sousa was at Canadian Tire where he participated in a demonstration showcasing the benefits of using winter tires to enhance safety in winter driving conditions. Over the last two years, the government has introduced a number of important and necessary reforms to Ontario's auto insurance system to reduce costs and lower the premiums of Ontario's more than 9.5 million drivers. In order to continue achieving rate reductions, the government outlined a series of further initiatives in the 2015 Budget, including bringing costs more in line with other provinces and providing Ontario consumers with more choice in purchasing auto insurance to suit their needs. Protecting auto insurance consumers and ensuring affordable premiums is part of the government's plan to build Ontario up. The four-part plan includes investing in people's talents and skills, making the largest investment in public infrastructure in Ontario's history, creating a dynamic, innovative environment where business thrives and building a secure retirement savings plan. Ontario’s accident benefits coverage is the most generous among provinces with private marketplace systems. 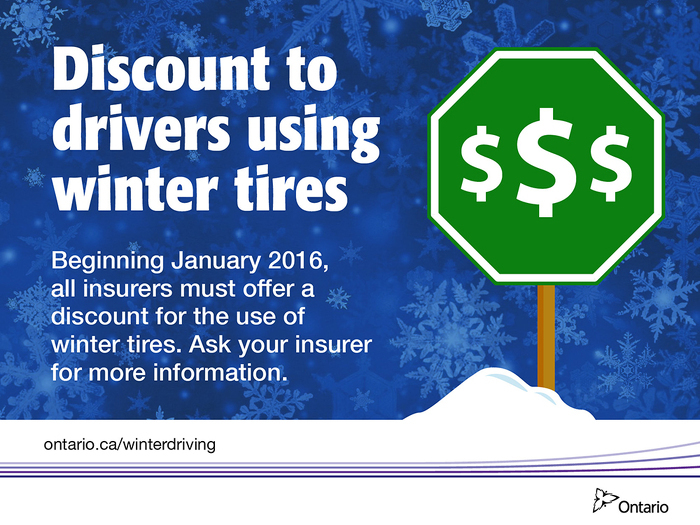 Drivers with winter tires need to first contact their insurance company to determine the amount of the discount they offer and the documentation they require to verify use of winter tires. This document was published on October 14, 2015 and is provided for archival and research purposes.